in Indiana. Our subject was educated in his home state, and later engaged in farming and teaching. On April 20, 1854, Mr. Huxford was united in marriage to Miss Dilemma Burton, also of Indiana. Mr. and Mrs. Huxford have had ten children, seven of whom are living: William, married, has two children, and lives in Merrick county; Josephine, wife of Eugene McDonald, has one child and resides in Idaho; Margaret, wife of J. M. Persinger, has seven children and lives in Central City; Alice, deceased in 1868; Rosella, wife of Edward Dorshimer, has two children and lives in Central City; Charles, married, has one daughter, and resides in Central City; Anna, wife of Robert Morrison, has five children, and lives in Merrick county; Clarence died in infancy, as did also Perry; and Dora, who resides at home. Mrs. Huxford died February 23, 1908. In the early days of 1860 Mr. and Mrs. Huxford, and family moved to Illinois where they farmed for eleven years, and during the winter seasons Mr. Huxford taught school. In February, 1871, they came to what was then known as Lone Tree, Merrick county, Nebraska, later the town name being changed to Central City. Here they homesteaded one hundred and sixty acres in section eighteen, township thirteen, range seven, which remained the home place until 1899 when Mr. Huxford retired from the farm and moved to Central City purchasing a good home where they now reside. Mr. Huxford has been prosperous and successful, and at one time owned nearly one thousand acres, all in Merrick county. He has served as director of his school district number forty-eight for about twenty years. Mr. Huxford is one of the early pioneers of his county, and passed through all the trying experiences and hardships of frontier life. In 1873 our subject shipped the first car load of corn out of Merrick county to North Platte, Nebraska. In 1872, he helped to build the First Baptist church, in Merrick county, and in 1875 was instrumental in organizing a Methodist church in Central City, of which he is a member. In politics he is a strong democrat. Though of English birth, Mr. W. S. Trenhaile of Bloomfield is American bred, having lived in the states since his eighth year. He was born in Cornwall, December 19, 1839, the second in a family of seven sons and seven daughters. His parents, George and Mary (Stevens) Trenhaile, were natives of the same county where the father was a farmer. The father emigrated with his family to America in 1847 sailing from Falmouth in the full rigged ship "Roslyn Castle," commanded by Captain Sadler. After a voyage of six or seven weeks, landed in Quebec, and proceeded thence by lake to Milwaukee, whence they traveled by wagon to Dodgeville, in Iowa county, Wisconsin. Here the father bought a tract of land, engaging in farming during the winter seasons, and when work was slack on the farm he worked in the lead and zinc mines in the southwest part of Wisconsin. In the fall of 1873 he joined his son, W. S., who had preceded him in 1872 and settled in Saunders county, Nebraska. Here the parents died in January of 1878 - the mother on Sunday, January 6, and the father the next day, both being interred at the same time. As nearly as Mr. Trenhaile can recollect the father was sixty-five and the mother about sixty-three years of age. W. S. Trenhaile followed farming in Wisconsin until the spring of 1860 when he joined a party of gold seekers bound for Pike's Peak, passing up the Platte valley through Nebraska. Returning in the fall after but indifferent luck in the mining country, he remained under the parental roof until 1864, when, in company with his father and brother he again crossed the plains, passed over the mountains and joined in the search for gold in California. The father soon returned to Wisconsin, while the son remained a year in the golden state at the famous mining camp, Grass Valley, from where he, with six others, traveled on horseback to Montana and was employed in the mines there for eighteen months, twelve at Virginia City, and from March to September in 1866, in Helena. Horses for the journey were purchased at Marysville, California, the day of Lincoln's funeral. On his homeward journey, Mr. Trenhaile took a boat on the Missouri river at Fort Benton for Sioux City, and proceeded thence by stage to New Jefferson, the western terminus of the railway at that time. The construction train was the only means of transportation until they reached Boone. An account of these tribulations of travel sound queer in these days when railroads traverse nearly every section of our land. On reaching Wisconsin again, Mr. Trenhaile married and followed farming there until his migration to Nebraska in 1872, when he drove through, camping by the wayside on the journey of about three weeks. He bought a farm in Saunders county and later eighty acres where the town of Cedar Bluffs now stands, and lived on his quarter section most of the time until 1880 when he moved to Fremont. In 1875 he rented the farm and went into the Black Hills, the lure of gold having drawn him to where many were making rich strikes, in the yellow metal; but finding the opportunities less than he had anticipated and the Indians hostile, he shortly after returned and lived in Fremont until he could again gain possession of his farm. In 1880 he went into the. grocery business in Fremont, but about four months later sold out and opened a shoe store with a partner who continued the business when Mr. Trenhaile withdrew two years later. til 1892 led the life of a ranchman. At that time his nearest trading point was at Yankton, twenty-five mles [sic] away. When Bloomfield was platted and sold, Mr. Trenhaile purchased lots on the hill in the east part of town, and planted the first trees in this section of the city. Besides his present large two-story house, built in 1903, Mr. Trenhaile has owned several other pieces of city property and now owns a few building lots. Mr. Trenhaile was first married at Mineral Point Wisconsin, in 1869, to Miss Margaret Curnow, whose parents emigrated from Cornwall. Two children were born to them, but both are deceased. Mrs. Trenhaile died in 1901. Mr. Trenhaile's second marriage took place at Mineral Point, Wisconsin, to Miss Mary J. Martin, whose parents emigrated from Cornwall during her infancy. She was an intimate friend and schoolmate of the first wife. Mr. Trenhaile was living on the ranch at the time of the well known blizzard of January 12, 1888, and although he had two hundred head of cattle out in it, he got all of them into shelter and lost none, while some neighbors lost nearly all they had. Of his original section Mr. Trenhaile has sold four hundred and eighty acres, and later purchased a half section in Sherman county, Kansas. In politics he is a democrat, and is a member of the Methodist Episcopal church. In 1901 Mr. Trenhaile made a tour of the west, visiting Portland, Seattle, and Lake Cheland, besides many points of interest in British Columbia, both on the coast and the Selkirk Rockies, returning by way of Minneapolis and St. Paul. In 1909 he visited points in the south, including Houston, Galveston, Corpus Christi, and Brownsville, in Texas and Metamoras in Old Mexico. Mr. Trenhaile is hale and hearty, of strong vitality and rugged health, with his mind unimpaired by the strenuous life he has led. By business energy and thrift he is now enabled to take life easy in one of the finest and most elegantly furnished dwelling in his home town. Linas W. Barber one of the leading old-time residents of Boone county, Nebraska, is a highly respected farmer of Boone precinct. Since locating here in 1872, he has worked faithfully, and has succeeded in accumulating a nice property, now owning a finely developed farm and enjoying a pleasant home and all the comforts of rural life. The place of Mr. Barber's birth was in St. Lawrence county, New York, and the date July 2, 1843. His father and mother were Lahira and Annis Barber, he being the seventh member in a family of ten children. When Linas was a small boy, his parents removed to Kane county, Illinois, and there he grew up, receiving a common school education, and remaining on the home farm until he was of age. He then went into Brown county, Wisconsin, and spending his time for several years between Wisconsin and Illinois, finally coming Boone county, Nebraska in 1872. He made the entire trip from Wisconsin by wagon team, and landed in the vicinity in June, immediately filing on a homestead on section six, township nineteen, range five, west. He was almost the first white man to make settlement in that portion of the county, and is one of the few genuine old-timers left here, who seen all of the changes that have come to the place. He has resided during all of this time on his original claim which he has converted from a wild barren tract to a fertile farm, supplied with every convenience in the way of buildings and equipment for the operation of a model grain and stock farm. Mr. Barber was married in Green Bay City, Wisconsin, on October 29, 1867, to Miss Elizabeth Lindsay, who was a native of Michigan, and of Scotch descent. To, them have been born seven children, four daughters and three sons, named as follows: Arthur and Frank, married and living in Duluth, Minnesota; Anna, William, Florence and Minola, at home, and Lois, wife of Fred Foltz, they living north of Albion. The family are well known throughout their section of the country, and have many, warm friends and acquaintances, and enjoy the hospitality of their pleasant home. In the person of Mr. George Burghardt, who has a comfortable home in Logan township, we have one of the prominent old timers of Knox county, Nebraska. He has made this his permanent home since 1880, and during this time has been a part of its growth and progress, and a history of the county would be incomplete without a review of his career. Mr. Burghardt is a native of Bohemia,Germany, and was born in 1864. He remained with his parents until his sixteenth year, then struck out for himself, having determined on coming to America, from which country such glowing accounts had come to him of the wonderful opportunities to be had. He embarked at Bremen and landed in Baltimore, stopping in that city long enough to get his ticket to the west. He reached Nebraska in October, 1879. For seven years he worked in a packing house and on farms, and then bought one hundred and sixty acres in section eight, township twenty-nine range seven, and moved to the place with his wife and child. He built a shack fourteen by twelve feet, and saved all that he could earn to improve his place planting trees, and getting some of the land under cultivation, in the meantime. best improved in the township. Mr. Burghardt was united in marriage to Miss Mary Kurka in June, 1887, and three children came to bless their home: Lena, Rose and Mary, all charming girls. Mrs. Burghardt died August 4, 1903. Herman J. Marten, who owns a well equipped stock and grain farm of over nine hundred acres of land on section twenty-five, township seventeen, range twenty-two, and adjoining sections, is prominent in local affairs and always ready to forward the cause of progress in his county and state. He is a native of Germany, next to the youngest child of Frederick and Dorothy (Luetzow) Marten, and their only son, his birth occurring September 9, 1864. The parents had four children, and in June, 1868, they brought them to America, locating first at Petersburg, Menard county, Illinois. They lived in that county until the fall of 18620 [sic], when the father and son came to Custer county, Nebraska, to look over the country in search of a place to locate. The father secured a tree claim and they returned to Illinois, but the following spring the son, Herman, returned to Custer county to live, taking up a homestead when he reached his majority. The father and mother, with one daughter, came to Custer county, in the spring of 1884, and the former took up a homestead which was the home of the parents the remainder of their lives. The father died in September, 1895, and the mother in September, 1900. One daughter, Mrs. Amelia Safranek, and her family, came to Custer county in 1890, to make their home with her parents, and they now live on the old homestead farm three miles west of Merna. The younger daughter was married to August Hoffman, of Menard county, Illinois, in 1890, their marriage taking place in Custer county. After their marriage they went to Illinois to live. Herman Marten has made Custer county his home continuously since the spring of 1883 and is now one of the most prosperous farmers and stock men of his part of the state. He passed through many trying experiences during his early years there, but has been an energetic and progressive manager, and now has a fine farm to show for his efforts and thrift. He is a man of stability and worth, and though much interested in local affairs, has never sought public office or honors. He is a member of the school, board of district number seventy-four, and in years past has held various township offices, and is recognized as a public-spirited citizen. Mr. Marten was married in Petersburg, Illinois March 4, 1908, to Miss Katie Juergens, and have two children, Frederick and Dorothy Una. Jacob B. Klump, of Broken Bow, Nebraska, now retired from active life, is one of the earlier settlers of Custer county, and is the owner of two thousand and two hundred acres of good farm land, most of it within the county. He has passed through the various periods of central Nebraska's history for the past thirty years, and is a prosperous and successful man of affairs. Mr. Klump was born in Wurtemberg Germany, December 24, 1834, fifth of the thirteen children of John M. and Frieda (Wolf) Klump. One son, Charles, lives fourteen miles north of Callaway; a daughter, Mrs. Sophia Schaad, lives at Evanston, Illinois; one daughter, Mrs. Mary Finkbinder, lives in Germany, and several of the children are deceased. Both parents were born in Germany, the father died in 1849, and the mother in 1867. When about nineteen years of age Jacob B. Klump and his sisters, Sophia and Katherine, came to America and located in Illinois. He worked at farming for several years and on September 4, 1861, enlisted in Company G, Thirty Ninth Illinois Volunteer Infantry, serving until the close of the war. He received his final discharge at Springfield, Illinois, December 16, 1865, having been promoted October 12, 1864, to rank of corporal, and on May 1, 1865, to that of sergeant. He had participated in sixteen different engagements and was slightly wounded, several times, and for six months had carried the flag of the regiment. Mr. Klumb was married February 29, 1864, while home on a furlough, to Miss Jane Parkinson, their union taking place at Freeport. She was born in Jo Daviess county, being the first white child born in Ward's Grove precinct. In the spring of 1883 Mr. Klump brought his wife and their nine children to Nebraska, having in April of that year; filed on a homestead of one hundred and sixty acres of land in Custer county, and a timber claim of the same size adjoining, on section twelve, township seventeen, range twenty-three. The family lived in York county about one year before locating on the homestead, and Mrs. Klump died there on December 3, 1906, having been a good wife and mother and mourned by a wide circle of sincere friends. She left nine children, namely: Sophia E., wife of F. A. Bertram, of Missouri, has five children; Herman R., of Ringgold, Nebraska, has three children; Julia, wife of James Halliwell, of Custer county, has two children; William F., of McPherson county; Mae is a teacher in Montana; Ruby, wife of Fred Hackbarth, of Lincoln county, has four children; Hardy lives in Custer county. He served two years in Spanish-American war in Philippine Islands campaign in Company M, First Nebraska Infantry. Olive is a teacher, of Idaho; August E. lives in Lincoln county. justice of the peace in Illinois and also in Nebraska and for the past two years has been county supervisor in Custer county. He was married (second) on October 5, 1907, in Kearney, Nebraska, to Mrs. Mary Koch, a native of Wurtemberg, Germany, who came to America in 1881. Her maiden name was Deininger and her first husband, John Koch, was burned to death on April 17, 1899, while fighting prairie fire on West Table, Custer county. Thomas Morrison and another man, who were working with him, were also burned to death. Mr. Klump lived on his homestead farm until April, 1910, when he came to Broken Bow and purchased a nice residence, which has since been his home. He is one of the best known men in the county and is highly regarded as an enterprising, public-spirited citizen. 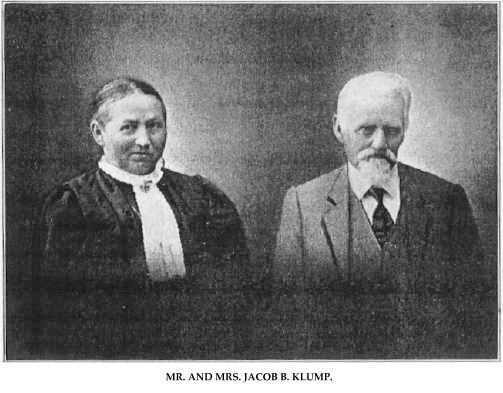 Protraits of Mr. and Mrs. Klump are presented on another page of this volume. Mr. and Mrs. Jacob B. Klump. Located very pleasantly in section twenty-nine, township twenty-six, range three, is to be found the somewhat notable gentleman whose name introduces this biographical writing. He has been identified with the history of Pierce county, Nebraska, from a very early date, and his contributed to the making of northeastern Nebraska, while they have largely consisted of those unobtrusive ways and habits of which little mention is ordinarily made, have been such industrious habits, such persistent and invariable honesty of purpose and force of character, and such an earnest desire to live the best American life, that he is widely known as one of the leading and influential early settlers of the county. George Vinson was born in 1842, in the village of Mervinstaw, County Cornwall, England, and was one of the youngest of a family of eight children. When he was eight years of age his father died, and the mother then brought her eight children to America. They started from Plymouth, going by sailboat to Quebec, being on the water six weeks. After landing, they proceeded to Montreal, from there to Winnebago county, Illinois, and a few years later to Freeport, Illinois, the mother having in the meanwhile married J. C. Burge. While residing here, our subject enlisted December 5 1861, in Company B, one of the five companies from Freeport in the Forty-sixth Illinois Volunteers. During active service in the battle of Jackson, Mississippi, Mr. Vinson was seriously wounded and sent to a hospital. He participated in the battles at Fort Donelson, Fort Henry, Shiloh, where he sustained a bayonet wound in the arm, siege of Corinth, and down the Mississippi river. While at Holly Springs, the army was cut off from supplies, and the soldiers relished "hard tack" and "mule's corn" as maize was called, as we would a piece of cake; our subject also engaged in battles at Memphis, Tennessee, and from thence to La Grange, then Vicksburg, and Jackson, Mississippi; at latter place he was shot in the jaw, of which wound he still carries the sear. His regiment then went on to New Orleans to Fort Blackley. Mr. Vinson's two brothers, John and Thomas, also served in the civil war. John was killed by Morgan's band of raiders, and Thomas, who was in Company A, in the same regiment with our subject, now lives in Knoxville, Iowa. After the war our subject returned to Illinois, then in 1866 moved to Iowa, where he followed farming in Berton and Marion counties. He moved to Madison county, Nebraska, where he lived two years, then in 1886, came to Pierce county, where he homesteaded land in section twenty-one, township twenty-six, range four. He owns three hundred and twenty acres in section twenty-eight, and one hundred and sixty-six acres in section twenty. Mr. Vinson was married in 1865 to Miss Sarah Simmons of Maryland and to this union nine children have been born: Maggie, married Chris La France, of Burt county, and has two children; Charles, married Miss Basser, and has one child; Anna, married Lute Jenkins; Eliza, married Thomas Daniels; Emma, married Ed Jones; John married Maude Crawford, and has one child; George, married Emma Reimers and has two children; Cora, married William Andrew Buckley; and Maude married James Clark. Mr. and Mrs. Vinson and family enjoy the highest respect and esteem of the people of their community. Mr. Vinson owns four hundred and eighty acres of land, five acres being put to trees. He is a member of the Grand Army. Wm. M. Waggoner, whose fine farm of four hundred acres in Howard county is a credit to his locality, is a man of broad mind and one prosperous agriculturists of Fairdale precinct. He has always personally superintended the management of his estate, and to his earlier career of industry and thrift is due the possession of his present fine property. At one time he owned considerably more land than at present. Mr. Waggoner was born in Clearfield county, Pennsylvania, on November 8, 1842, being the oldest in a family of eight - five boys and three girls. ceeded in developing a good farm. His home place is situated on the North Loup river, and is one of the best equipped and most productive tracts in the section, He has carried on diversified farming and stock raising, meeting with decided success in both lines. On March 8, 1866, Mr. Waggoner was united in marriage to Margaret J. Wakefield, who is a native of Pennsylvania, born in Center county, although her girlhood was spent in our subject's home vicinity. She is a woman of very lovable character, patient and uncomplaining, although for many years she has been an invalid. Mr. and Mrs. Waggoner have five living children, namely: John A., married and living in New Orleans, Louisiana, father of one child; Ella, wife of Wm. Hinkley, having two children, and residing in Howard county, this state; George W., married and living in Louisiana; Frank W., of Elba, and Henderson G., who was married to Annie C. Hutshell, in 1962, and is engaged in farming near his father's homestead. Mr. Waggoner has always been prominent in neighborhood, and county affairs, and for a number of years has been actively identified with educational mattert [sic] in his district. He and Mrs. Waggoner have been for years members of the United Brethren church at Elba. In politics Mr. Waggoner is a republican. At the present time (1911), Mr. Waggoner is one of two of the settlers who came to this section of Howard county during, or before, 1872. Of the prominent and leading old settlers of eastern Nebraska, none are held in higher esteem by their fellow citizens than Adam Smith, retired farmer, who resides in Ord. Mr. Smith has been closely identified with the best interests of his home county and state since 1883. Adam Smith, son of George and Catherine Smith, was born in Newport, Kentucky, November 28, 1835, and was ninth in a family of ten children. He has a sister, Mary, now Mrs. George Phillippe, residing in Bicknell, Indiana, the others being deceased, as are also the parents, the father passing away in February of 1866, and the mother in February of 1867, surviving her husband just one year, their deaths occurring in Indiana. When but two years of age Mr. Smith went with his parents to Vincennes, Indiana, where he received his education and grew to manhood. On September 23, 1858, he was married to Miss Catherine Blancit of Edwardsport, Indiana. Miss Blancit was a native of Alabama. Of this union two children were born, namely: Rosa B., wife of Perry Pierson, has two children, and lives in Valley county, Nebraska; and George E., who is married, has two children, and lives in Howard county, Nebraska. Mrs. Smith died on the home farm, February 19, 1893, survived by her husband and children, and deeply mourned by all. On July 31, 1861, Mr. Smith enlisted in Company B, Twenty-sixth Indiana Volunteer Infantry, serving all through the war, and received his honorable discharge January 26, 1866, at Vicksburg, Mississippi. The decisive battles engaged in were the siege of Vicksburg, siege of Mobile, and Prairie Grove, Arkansas, and many minor engagements and skirmishes. Mr. Smith, in 1862, was promoted to regimental commissary sergeant. He was commissioned lieutenant in August, 1865, but as hostilities had ceased, he was never mustered in as an officer. After the war, he returned to Indiana, engaging extensively in the stock business, owning one of the finest stock farms in the state. In April of 1883 Mr. Smith came with his wife and two children to Valley county, Nebraska, homesteading one hundred and sixty acres of land twelve miles west of Ord; he also timber claimed one hundred and sixty ty [sic] acres and purchased another one hundred and sixty acres of Burlington and Missouri railroad land. After living for two years on the homestead he moved on the timber claim, where he remained until 1896. In September of 1894, Mr. Smith was married to Miss Rachel Polk of Indiana. In 1896 they moved to Ord, where Mr. Smith purchased a good home, where he still lives. Mrs. Smith died April 9, 1905, at her home in Ord. Mr. Smith has been prosperous and successful, and at one time owned thirteen hundred acres of land, but sold out in 1903. In November of 1895 he was elected sheriff of his county, serving in that office four years. On July 3, 1907, Mr. Smith was united in marriage to Mrs. Anna R. Purmann, of Cleveland, Ohio. Mr. and Mrs. Smith are living in the old Ord home, enjoying the respect and esteem of their many friends. Mr. Smith is a progressive man, and has traveled widely, and notwithstanding his mature years is still active and interested in all the affairs of the times. Gottfried Wolski, long familiar to the people of Madison county, Nebraska, where his fortunes have been cast for many years, is a striking representative of those sterling qualities and manly virtues that peculiarly marked the pioneer settlers of Nebraska. His career demonstrates the value of persistent and well directed effort, and the competence which he has acquired stands for hard and faithful work. Mr. Wolski is a native of Germany, born October 9, 1842, in the province of Prussia, and is a son of Gottlieb and Anna Wolski, both natives of Germany. Our subject's father was a herder in the old country, and after growing to manhood, as well as during his school years, the lad helped his father, remaining at home until he was twenty-four years of age. In 1872 Mr. Wolski left the fatherland for America, embarking at Bremen on the sailboat "Columbus," and after a voyage of twelve weeks, landed in New York. After reaching the new world, he proceeded directly to Michigan where he lived about six years, coming to Madison county, Nebraska, in 1878. After reaching Madison county, Mr. Wolski took up a homestead claim of eighty acres in section eight, township twenty-three, range two, and on this land built a log house and made steady improvements. Mr. Wolski now owns two hundred and eighty-two acres of fine land and on this has two acres of trees. In those first days of hardships and dangers on the western frontier, our subject and family endured all the vicissitudes and experiences of that period. Many times they fought the raging prairie fires that would sweep down upon them at times without any warning, and quick work had to be done to save their lives and possessions; this was only one of the dangers to be met and overcome in those pioneer days, and Mr. Wolski can relate many incidents of western frontier life. Mr. Wolski was united in marriage in October, 1866, to Miss Minnie Kissner, a native of Prussia, and a daughter of Louisa Kissner. Mr and Mrs. Wolski are the parents of fourteen children, five of whom are living: Carl, August, Mary, Bertha, and Eddie. They are members of the German Lutheran church, and Mr. Wolski is a republican. One of the prominent citizens of Ansley is the gentleman named above who came to Nebraska at a time when the country was new and settlers were few. He is known as a successful man of affairs, a progressive farmer and enterprising business man. Joseph W. Cassel, the eldest of seven children in the family of Jacob and Jane (Noland) Cassel, was born in Wayne county, Ohio, on July 4, 1843. All of the children are still living and all reside in Dunn county, Wisconsin, except Joseph. The father, who was a native of Holland, died in Wisconsin, and the mother passed away in Iowa. When nine years of age, the subscriber went with his parents to Iowa, where he grew np [sic] to manhood on the farm and received his education in the local schools. On January 4, 1862, in Clayton county, Iowa, Mr. Cassel was married to Miss Mary White, a native of Bangor, Maine. Ten years later, with his wife and four children, Mr. Cassel came to Fillmore county, Nebraska, and pre-empted a quarter-section of land. After three or four years residence. there, he removed to Thayer county, later going to the town of Carlton, where he worked at the carpenter's trade. In the winter of 1877-78, he went to Buffalo county, Nebraska, and homesteaded a quarter-section about forty miles from Kearney. At the same time, he also purchased another quarter-section on Deer creek. In 1883, Mr. Cassel and family went to California, where he bought land and engaged in ranching for two years. At the expiration of this time, he returned to Buffalo county, Nebraska, and a little later, went to Sioux county. From here the family went to Fall River county, South Dakota, after several years, moving again to Flathead county, Montana, where he remained for eight years. Mr. Cassel came to Custer county, Nebraska, in 1909. He purchased ten lots in the city of Ansley, and built a comfortable modern home, where the family now lives. The following children have been born to Mr. and Mrs. Cassel, named as follows: William Walter, Abbie J., now Mrs. John Harse; George Y., Jacob F., and Mary E., now Mrs. Edward Woolfolk, who resides in Wyoming. John O'Donnell who resides in section thirteen, township thirty, range four, Knox county, Nebraska, has been identified with the history of Knox county from a very early date. Mr. O'Donnell was born in Withville county, Virginia, in 1855. His birth place being a farm house, and his associations from the first being with agricultural interests, it is natural, therefore, that he should be a farmer, and that he should find success in life's endeavors in the tilling of the soil. Mr. O'Donnell's father, Michael, was born in Ireland and was thirty years of age when he came to America. Our subject's mother, Ellen (Hefferland) O'Donnell, was born in Tipparary, Ireland. They were married in the United States. In 1880 Mr. O'Donnell came to Knox county, Nebraska where he took up a homestead in section thirteen, township thirty, range four, and also took a tree claim in section twenty-four, same township and range. He first built a sod house, and lived in this "soddy" for seven years, it proving to be a very comfortable dwelling place. Mr. O'Donnell went through many hardships in the first days of his settlement on the western frontier, but those times have passed to history, and he now the prosperity and conveniences of modern farm life. Mr. O'Donnell now owns eight hundred acres of fine land, and is a prosperous and substantial citizen in his community, where he is known and respected by a host of friends and associates. Mr. O'Donnell was united in marriage in 1875 to Miss Mary Morgan, and Mr. and Mrs. O'Donnell are the parents of four children, whose names are as follows: John M., who is married to Miss Endie Morgan, they having one child; and Mary, Charles and Joe. Mr. and Mrs. O'Donnell and family live in their comfortable home, where they are surrounded by a wide circle of friends and acquaintances. Among the prosperous farmers and early settlers of Merrick county, Nebraska, the subject of this review, William F. Campbell, occupies a high position. He resides on section four, township fourteen; range eight, where he has a fine farm and comfortable home, and enjoys the esteem and respect of all who know him. William F. Campbell was born in Porter county, Indiana, February 27, 1837, a son of Samuel and Elizabeth (Frame) Campbell, and was fifth in a family of seven children. His parents are now deceased, the father having died January 20, 1884, and the mother, March 18, 1895, both in Indiana. Our subject received his education in the home schools, and later engaged in farming. On January 1, 1862, Mr. Campbell was united in marriage to Miss Florissa Curtis, also of Indiana. In October, 1864, Mr. Campbell enlisted in Company C, One Hundred and Thirty-eighth Indiana Infantry, and served until close of war, receiving his discharge in Chicago, Illinois, in June of 1865, the time having been spent in Tennessee on guard duty. After the war, our subject came with his wife and six children to Merrick county, Nebraska, where he homesteaded one hundred and sixty acres of land in section four, township fourteen, range eight, which is still the home place. Mr. Campbell has been prosperous and successful, and owns four hundred and seventy-three acres of land, devoted to stock and grain. He was instrumental in organizing his school district number forty-nine, and served as moderator of same for a number of years. Mr. and Mrs. Campbell have had eleven children born to them: Silas, who is married, has three children and lives in Oregon; Leander, married, has one son, and resides in Merrick county; Sabina, wife of Clarence Newlon, has two children, and they reside on a farm in Howard county, Nebraska; Mahala, deceased, in 1907, survived by her husband, Sherman Cox; Prior, married, has four children, and lives in Merrick county; Homer, married, has two children, and also resides in Merrick county; Orlando, married, has two children, and lives in Merrick county; Robert, married, lives in Merrick county, and has three children; Walter also married, residing in Merrick county; Francina, wife of Arthur Nicholas, has two children, and lives in Merrick County; and Ruby, who resides at home. Mr. and Mrs. Campbell are among the earliest settlers of the county and passed through all the experiences and hardships incidental to pioneer life. Prominent among the leading old settlers of Knox county, Nebraska, the gentleman whose name heads this personal history, is entitled to a foremost place. He is a man of active public spirit, Always lending his aid and influence for the bettering of conditions in his home county and state. Mr. Phillips is a native of Iowa, his birth having occurred July 3, 1868. He is the son of Peter and Elizabeth (Hurley) Phillips. The father, a native of Illinois, was born in the year 1838, and died in California in 1906. The mother is a native of Indiana, and was born May 9, 1838. Our subject's father was a soldier in the Civil war, enlistIng in Company I, Thirty-eighth Iowa Infantry, and served all through the war. He was in the Thirteenth Army Corps, and the first winter was at New Madrid, Missouri. From there he went to Vicksburg, Mississippi, and was there from the beginning to the end of the siege. He then went to Port Hudson, then New Orleans, Brownsville, Texas, Fort Barancus, Alabama; Pensacola, Alabama, and Mobile. From the latter place, he went back to Houston, Texas, where the regiment was discharged, and later mustered out at Davenport, Iowa. In the fall of 1879, Peter Phillips, with the family, drove from Iowa, to Nemaha county, Nebraska, and remained until the following spring. They then came to Knox county, Nebraska, where they took up a homestead on sections thirty-one and twenty-eight, township thirty-one, range eight, and also took a pre-emption claim on section thirty, township thirty-one, range eight. He disposed of his Knox county property, and in 1894 went to California. The following fall he returned to Knox county for a short time, and then went back to, California, where he stayed until his death. E. C. Phillips has made a scientific study of agriculture, and in his experiments has found that the rotation of crops brings the best results. He is now engaged in mixed farming, along which line he has the best success. In 1893 E. C. Phillips bought the northeast quarter of section six, township thirty, range eight, where he lived until 1906, when he sold and purchased two hundred acres where he now lives, in section thirty-two, township thirty-one, range eight. In 1898 Mr. Phillips was united in marriage to Miss Rhoda Thayer, and they are the parents of five children, whose names are as follows: Alice, Elsie, Delbert, Mildred, and Lee. Mr. and Mrs. Phillips and family enjoy the friendship and esteem of a host of friends and acquaintances, and Mr. Phillips is a worthy, substantial citizen, and is so considered in his community. The gentleman whose name heads this article is one of the prosperous and influential pioneer farmers of Stanton county. He has been a resident of this county for nearly thirty years, and is known throughout the locality as a man of energetic habits and sterling worth. He has a very pleasant home located on section twenty-nine, township twenty-four, and has gathered about his the comforts and many of the luxuries of life and is reaping the reward of his many years of earnest labor.